Football (soccer) is the flavor of the season all over the world. Every discussion we have over the next month involves terminology like goal, penalty, red card etc. Billions of people around the world are currently immersed in FIFA Football World Cup 2014 and anything other than football just simply doesn’t exist to them. Millions will throng to the stadiums in Brazil to watch the football world cup matches live. For us mere mortals who are not so lucky, we have made a list of the top 5 iOS and android football games to immerse ourselves in the FIFA Football World Cup 2014 frenzy surrounding us. Here we go with our take on the best FIFA Football World Cup 2014 iOS and android game apps. 1. 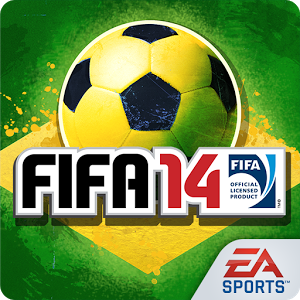 FIFA 14 by EA SPORTS: FIFA 14 is the best football game out there in the app stores. EA Sports has officially licensed the 2014 FIFA Football World Cup Brazil national teams, kits, and Adidas Brazuca ball for the FIFA 14 app. FIFA 14 by EA Sports is an app that oozes authenticity for the true blue football world cup fans. 2. Dream League Soccer: Dream League Soccer is a fantasy football game. It gives you a chance to build your dream team. You can sign-up new players using coins or through the free transfer market. It also lets you train your players to perform better. Dream League Soccer gives you an opportunity to create the best football team in the world. 3. Perfect Kick: This is an awesome app that lets you become the star striker that you have always dreamed of becoming. Perfect Kick is a multi-player game that tests your penalty shootout skills against other players from around the world. The app is also super simple to use. 4. Stickman Soccer: Stickman Soccer is a fast paced simple football game. You can choose your team from 32 different national teams and play either 11 vs. 11 or 4 vs. 4 games. You can also set your players to manual running mode or automatic running mode. 5. Head Soccer: Head Soccer is a very easy to use multi-player football game. Easy to use doesn’t mean it’s very easy to play. The game requires basic Physics knowledge to excel. You can connect with other players through Bluetooth or game center. So, spice up your FIFA Football World Cup 2014 with the above games and do let us know your favorite app through the comment section. Check this unique football game with World Cup 2014! Thanks for listing top world cup updates apps. I have installed another light size (just 1.8MB) app, realtime score app http://bit.ly/fifa2014wc for World CUP 2014. You may also experience the difference & special features like auto refresh scores, notifications before the match etc. Try it. 2014 football world cup nice game.